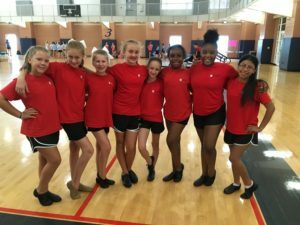 We started back in September with a dream of attending UDA Camp this summer. I told the girls today that there are two types of people in this world….those that watch things happen and those that make things happen. I told them that they made our trip happen today by making a commitment, working hard to raise funds, and believing me when I said it would be one of the best experiences of their middle school years. We arrived at TBS bright and early at 6:30am. Thank you Mr. Tony for coming on your day off to open the gate and to see us off! Thank you to Victoria’s Dad for our safety sendoff. Thank you to Liza’s Dad for your packing expertise. Thank you to all the parents who supported your daughter and helped make this trip a reality. It was the best feeling in the world pulling out of the parking lot with these amazing dancers. Laughs followed by songs, followed by stories, and more made our 3 hour drive pass quickly. Before we knew it we were pulling into our dorm area and unloading. Patterson earned one of her rays for her sunshine for coming back out to the van to see if I needed help. We all set up our rooms, made our beds, I hung their suns outside their doors, and we ate lunch. I watched the dancers ooh and ahhh over the amazing UDA staff dancers. The UDA staff members have to go through a rigorous audition and interview. Most of them are in college and this is their summer jobs. It is wonderful to have them as role models for our TBS students. The dancers learned their performance routine and realized how tough it can be. They stuck it out and finished like troopers. We went back to the dorm where Tori thought she would have enough time to take a nap….sorry Tori! It was dinner time and the girls loved the dining hall. I heard them tell the lady at the register thank you after every swipe (good listeners) and everyone pushed their chair in and cleaned up their area after they were finished. After dinner we headed back to the gym for home routines…wow they were so good! Our girls enjoyed seeing all the beautiful costumes. I know what they are going to want to raise money for next! After home routines it was time for DRILL DOWNS! They girls did ok but no yellow ribbons tonight. I told them it would happen tomorrow. Liza and Abigale were so very close. Back to the dorms to practice, practice, practice. I was able to get some girls to call their moms but most said they “were fine”. They practiced until everyone felt good about what they were doing. Liza and Abigale led two separate groups and then they joined and they rehearsed their routine at least 15 times. Great job ladies! It was finally time for awards and our nightly meetings. I gave out sun rays to everyone that earned them. Everyone got one for just making it to camp. Some of the reasons girls got an additional ray was for being positive, being a solid team member, hanging it when it was really hard, thinking about others and helping them out, and two got “fancy dancer” for looking their best. It is time for bed and most have had their showers. It is time for me now! I am currently hearing two girls (Amada and Ashleigh) share some sweet stories and talking about today. New friendships are being made, new experiences are taking shape, and confidence is being built and that is why camp is so awesome!